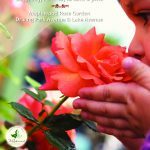 Maplewood Neighborhood Association: Community is our nature! It’s time once again for our annual Membership Drive. Election ballots for MNA Officers and Board Members will be mailed out on February 21, 2019. If you plan to run for one of these positions, or if you want to cast your vote, you must be a member of the MNA! Below are copies of the 2019 membership form and annual membership letter. (Current members will receive copies of these documents in the mail along with the ballot.) You can join or renew your membership by filling out the membership form and mailing it to the office, along with your annual dues payment. If you have any questions regarding membership, please call Enrica Fleming, Chair of the Membership Committee, at 458-3460. Purchase your tickets in advance and save $3! Tickets are available at the Peppermill, Parkleigh, and ReHouse. UPDATE: The Informational Meeting has been rescheduled. The new date is Monday, August 13. Same time, same place. Hope to see many of you there! The City of Rochester has just announced plans to build a new combined Lake Section RPD Station and Northwest Neighborhood Service Center on the northeast corner of Lake Avenue and Ridge Road West (the old Piehler Pontiac site across from Eastman Business Park). The City will be holding a public informational meeting on August 7 at the Edgerton Recreation Center. The attached pdf is a copy of a letter that has been mailed out to all residents and property owners in the project area. The Lake Section police station and NW Neighborhood Service Center are currently located at 1099 Jay Street. The Lake Section patrol area covers the west side of the city from Charlotte in the north all the way to I-490, south of Lyell Ave. So this location for the offices would place them in a location more central to the whole area. If you want to learn more about this proposal, or have input you want to share with the City, please consider attending. Join us next Wednesday evening for a night of food and fun with your neighbors! The Hot Dog Roast is an annual neighborhood event where people can get a meal, make some friends, have some fun, and get connected to resources in the neighborhood. It is free for everyone! All are welcome, but the Northwest Neighborhood Service Center would appreciate a heads-up if you plan to attend. 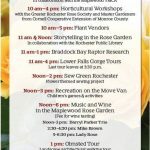 To RSVP, please contact Tiara Lopez at 585-428-1322. 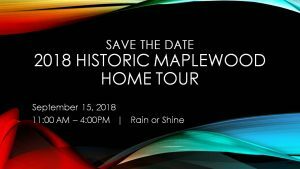 Save the date for the upcoming 2018 Historic Maplewood Home Tour: September 15th, from 11AM to 4PM. Rain or shine! 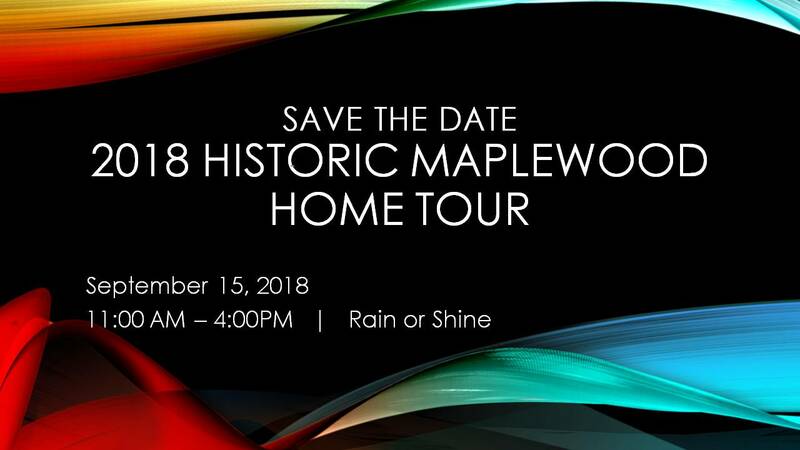 2018 Home Tour Ticket Information! COMING SOON! 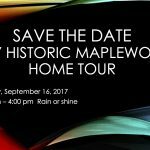 Tickets will be available for the 2018 Historic Maplewood Home Tour in August. Please check back for more information where you can purchase tickets in advance. 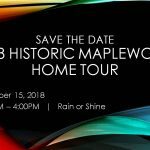 The Historic Maplewood Home Tour page has been updated with details for the Saturday, September 15, 2018 event! 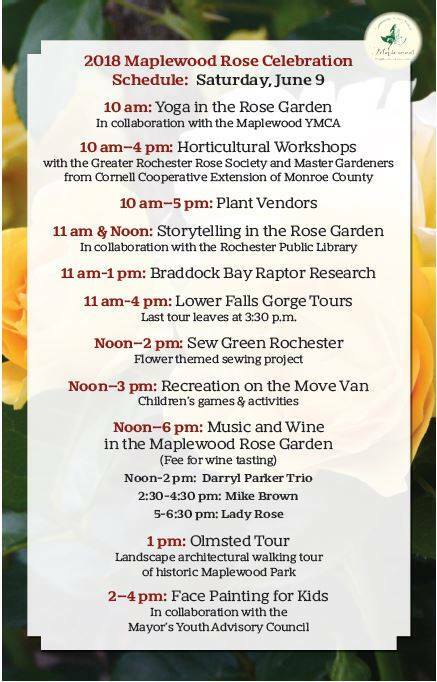 Swing on over to the Home Tour page for details!